The American Folklore Theatre can now add “Award Winning” to their long list of accolades. 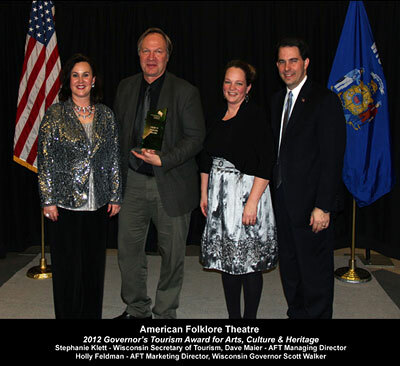 American Folklore Theatre was awarded the inaugural Wisconsin Department of Tourism Award for Arts, Culture and Heritage at this week’s Wisconsin Governor’s Conference on Tourism (WIGCOT) in Green Bay, WI. This award is presented to a business or destination that showcases the arts, culture, or heritage for the enhancement and economic wellbeing of a community. Sponsored by the Governor’s Council on Tourism, the Governor’s Awards acknowledge leadership, commitment, and innovation among the people and organizations that propel the tourism industry forward. The awards were presented Tuesday evening at the Governor’s Dinner with approximately 1,000 tourism professionals and Wisconsin business owners in attendance. George Tzougros, Executive Director of the Wisconsin Arts Board, began by reading a summary of AFT’s nomination and then turned the microphone over to Governor Walker to present the award. “I was shocked. When they started describing the winning organization, we knew immediately that we had won, but I just couldn’t believe it,” commented AFT’s Manager of Marketing and Audience Development, Holly Feldman. “We were nominated with several really amazing organizations.” The Arts, Culture and Heritage category was by far the largest category represented at the conference with nine nominees, including American Players Theatre, Door County Visitor Bureau, Driftless Market, Madison Children’s Museum, Marquette County “Barn Quilt and Hidden History Mural Trail,” Peninsula Players Theatre, The Pfister Hotel, and Shake Rag Alley Center for the Arts. Tickets for AFT’s summer and fall season will go on sale April 16th in the AFT box office at the Green Gables shops in north Ephraim, via phone at (920) 854-6117, and online at www.FolkloreTheatre.com. American Folklore Theatre is a non-profit professional theatre organization that produces original musical shows in repertory from June through August. AFT continues its performances into the fall with shows at the Door Community Auditorium and town halls September through October and over the Christmas holiday. American Folklore Theatre is a member of Theatre Wisconsin and the Theatre Communications Group (TCG), organizations that promote non-profit theatre groups.